Thomas Rucinski was born in Hammond, Indiana in 1949, graduated from Bishop Noll Institute, obtained a B.S. from Indiana University Business School and graduated from Valparaiso University School of Law with a Juris Doctorate degree in 1974. As of January 1, 2018, Mr. Rucinski has changed his status with the firm to "of counsel". He continues to consult on matters relating to the firm. 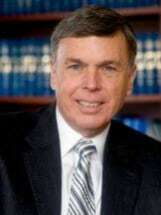 Mr. Rucinski began his legal career as a Law Clerk with the law firm in 1972. Mr. Rucinski has been with the firm in some capacity ever since. Mr. Rucinski has been involved in numerous types of cases, including family law, personal injury and criminal cases. He's obtained favorable recoveries for clients against local and state governments, corporations, doctors and dentists. As a licensed pilot, his knowldege of the Federal Aviation Agency and the National Transportation Safety Board provides him with additional tools with which to handle aviation related matters. Mr. Rucinski focused a significant portion of his time in the area of family law. His philosophy in representing divorce clients was to amicably reach a settlement on all issues without time consuming and costly litigation. However, there are times when, for a variety of reasons, settlement is impossible. In these cases, Mr. Rucinski recognized that vigorous representation is the only alternative. In the l 970's, as lead attorney, he was filing an average of 50 new divorce cases per year. Although he stopped keeping track of new divorce filings, he estimates he represented over 1,000 different spouses or ex-spouses in family-related matters. Three of his cases set legal precedent in Indiana, see: In Re Buehler, which deals with the issue of voluntary underemployment; In Re Gnerlich, which deals with disability payments being included in the marital estate and therefore a divisible asset; and Baxendale v. Raich, which deals with the relocation of an eleven year old child from Northwest Indiana to Minneapolis. Mr. Rucinski has an admirable Appellate being successful in the following cases: Willsey v. People; Terpstra v. Terpstra; Milligan v. Milligan; and Clark v. State of Indiana. Mr. Rucinski has represented clients in divorce cases throughout Indiana, including: Hammond, Gary, East Chicago, Crown Point, Munster, Highland, Dyer, St. John, Hobart, Valparaiso, Kentland, Rensselaer and Michigan City. Mr. Rucinski is proud of his record mediating cases in the filed of family law and remains available to assist couples and their counsel with mediating their disputes. Mr. Rucinski is honored that he received statewide recognition as the 2014 Family Law Lawyer of the Year for the South Bend Metropolitan Area including Lake and Porter Counties. Mr. Rucinski was given a Martindale-Hubbel ®AV® rating from his peers. He has been selected by his peers for inclusion in The Best Lawyers® in America 2008 (Copyright 2007 by Woodward/White, Inc., Aiken, S.C.) and every subsequent year in the field of Family Law. Since its inception in 1983, Best Lawyers has become universally regarded as the definitive guide to legal excellence in the United States. In addition, Tom is equally proud that he has also earned the SuperLawyers® (Registered trademark of Key Professional Media, Inc.) designation awarded by Law & Politics and has been named in the SuperLawyers® magazine.